Good negotiation skills are a vital attribute for any contractor. The perils of the IR35 tax legislation mean that a poorly worded contract can cost a contractor as much as 25 per cent of their take-home pay – but a methodical negotiation process can help to eliminate this risk. IR35, a set of rules that blight the tax affairs of contractors across the country, is sadly misunderstood by most firms. Indeed, many are completely unaware of its existence. You may have a bit of a fight on your hands to ensure that your contract does not fall foul of IR35 – and to explain to your client that the changes necessary will not cost them more money. When deciding whether or not you fall within the bounds of IR35, HM Revenue and Customs will focus particularly on your working arrangements. If you wish to be treated by the taxman as a contractor rather than an employee, it is vital that your contract makes clear that the location in which you complete your work, and the equipment you use to do so, is at your discretion. This helps underline the fact that the client does not control your working patterns in the way that they would if you were an employee. The taxman is likely to be suspicious of contracts that include a monthly payment, as this looks like a salary. Instead, try to negotiate an arrangement in which you are paid on completion of certain ‘milestones’. Depending on your other tax affairs you may also wish to pay yourself through dividends. If this is the case you must ensure that payment is made by the client to your limited company, rather than your personal account. Ask your accountant if you are unsure about dividend payments. Your contract should also include a right of substitution – meaning that you are contractually permitted to provide a suitable replacement if you are unable to complete the work. This is a key sticking point for many clients, but you should try to make them understand that they are paying for a service, rather than for you personally. Of course, the substitution would be at your expense rather than theirs. 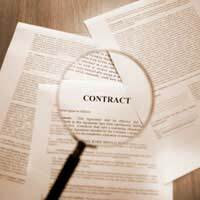 In an employment contract, the employer is obliged to give the employee work and the employee is obliged to accept it. You should ensure that this ‘mutuality of obligation’ is explicitly avoided in your contract if you wish to be treated as a freelancer or contractor. The contract should have a clear end date, or a way of measuring when the work has been completed. Where possible you should have a ‘schedule of work’ attached outlining exactly what will be achieved. As well as this, you should include a simple clause stating that the client is not required to offer any more work once the current job has been completed. Contractors and freelancers face a particularly tough task negotiating agreements that are mutually acceptable. But it is worth fighting for a good contract – as a poorly worded agreement can put you on the wrong side of IR35, with costly consequences.